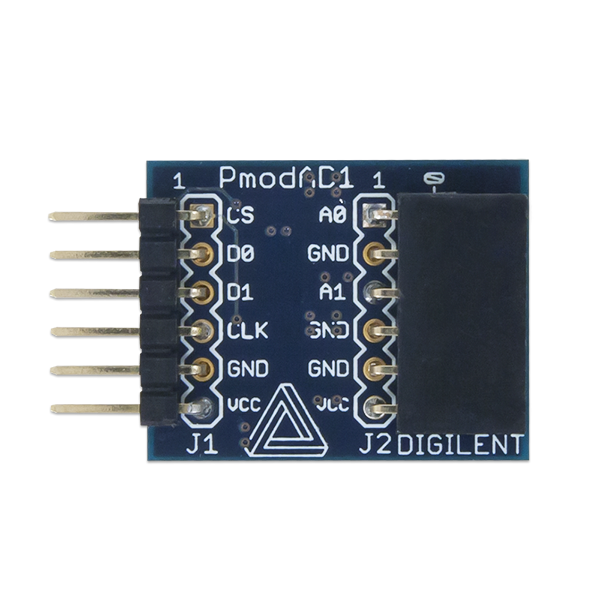 The Digilent Pmod AD1 (Revision G) is a two channel 12-bit analog-to-digital converter that features Analog Devices' AD7476A. With a sampling rate of up to 1 million samples per second, this Pmod™ is capable of excelling in even the most demanding audio applications. 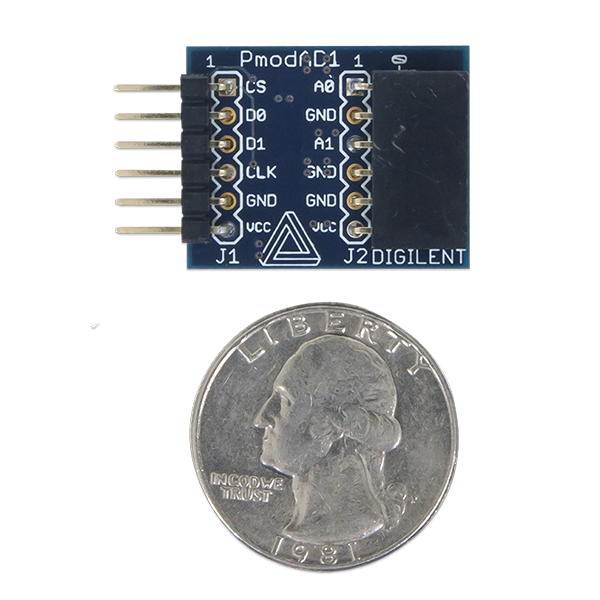 The Pmod AD1 converts an analog input signal ranging from 0 volts to Vdd to a 12-bit digital value in the range 0 to 4095. As each of the A/D channels are separate from each other, the user can convert a single stream of analog signals with just one channel or convert two different streams of analog signals simultaneously. Because each of the ADCs are able to provide up to 1 MSa of their 12-bit conversions, a 2-pole Sallen-Key anti-alias filter with poles set to 500 kHz are provided to keep analog input bandwidths to a suitable frequency range. The Pmod AD1 communicates with the host board via an SPI-like communication protocol. The difference between the standard SPI protocol and this protocol is manifested in the pin arrangement on this Pmod. A typical SPI interface would expect a Chip Select, a Master-Out-Slave-In, a Master-in-Slave-Out, and a Serial Clock signal. However, with the two ADCs on this chip both of the data lines, MOSI and MISO, are designed to operate only as outputs, making them both Master-In-Slave-Out data lines. The Pmod AD1 will provide its 12 bits of information to the system board through 16 clock cycles with first four bits consisting of four leading zeroes and the remaining 12 bits representing the 12 bits of the data with the MSB first. The first leading zero is clocked out on the falling edge of the CS signal with all of the subsequent bits clocked out on the falling edge of the serial clock signal. Any external power applied to the Pmod AD1 must be within 2.35 to 5.25 volts to ensure that all of the components in the Pmod AD1 work correctly. The pins on the pin header are spaced 100 mil apart. The PCB is 0.95 inches long on the sides parallel to the pins on the pin header and 0.80 inches long on the sides perpendicular to the pin header. The schematics of the Pmod AD1 are available here. 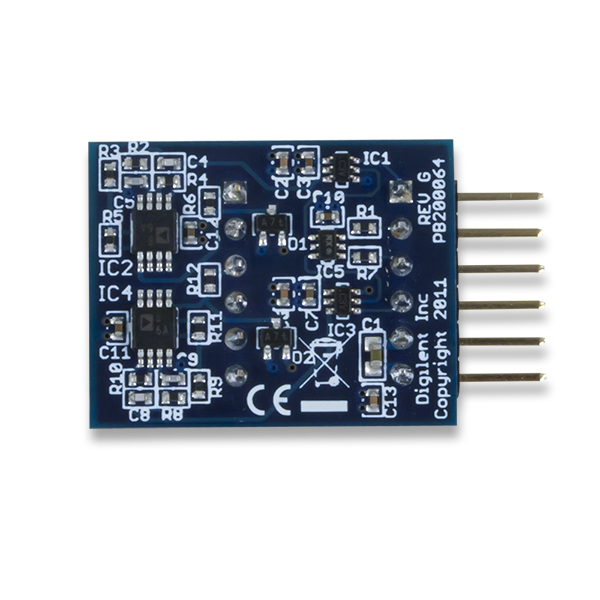 Additional information about the AD1 including the datasheet for the ADC can be found here. The datasheet for the op-amps used in the anti-aliasing filter can be found here. Example code demonstrating how to get information from the Pmod AD1 can be found here. 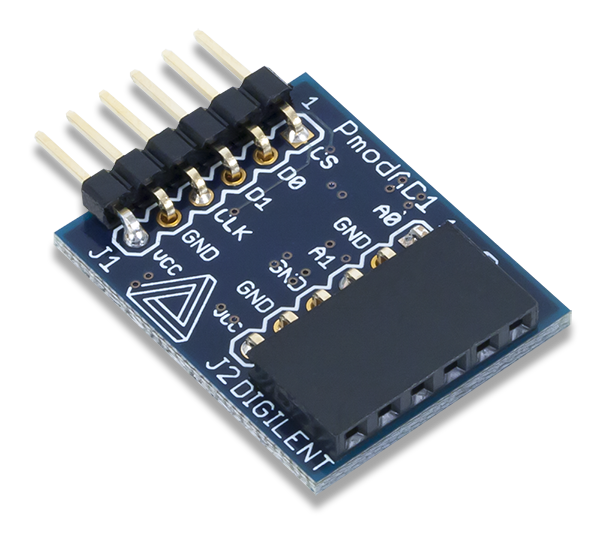 If you have any questions or comments about the Pmod AD1, feel free to post them under the appropriate section (“Add-on Boards”) of the Digilent Forum.